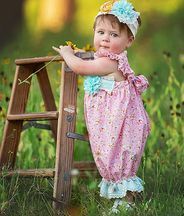 Baby couture clothes for little ones by Haute Baby are designed and made in Texas! 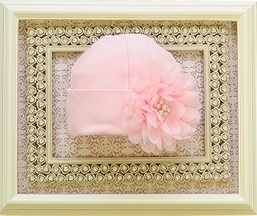 One of LaBella Flora's favorites, the Harvest Time collection, and it's beyond adorable. 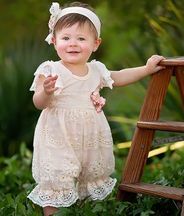 The baby girls romper with the big sister legging set creates a one of a kind photo opportunity. 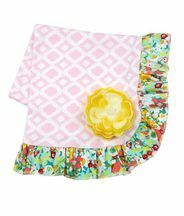 Take Me Home Outfits for your little princess abound in every collection that Haute Baby offers, creating a head to toe look including the blanket to bring her home from the hospital in. 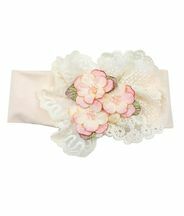 A sophisticated splash, they have been proud to dress your darling daughters since its start in 2003. 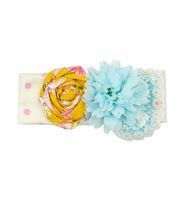 With their initial debut, Haute Baby quickly became beloved for their beautiful take home gowns and matching accessories. 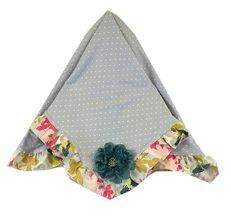 High quality fabrics are used in every design, often feature 100% cotton or a high cotton blend. 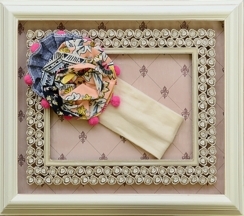 Ornate ruffles and trims compliment each outfit and bring in new colors or fabrics. 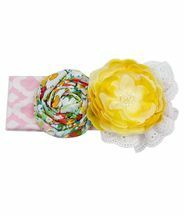 With superb quality and selection that both moms and little girls love, we have been proud to offer this brand since we first began. As the brands popularity grew, demand also grew for larger sizes. Purrfect was born in 2010 and was welcomed with joy. 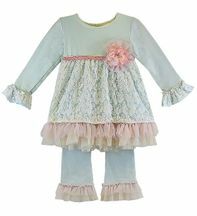 Every tunic set and girls special occasion dress is dolled up with sweet fabrics and stylish trims, living up to their name. 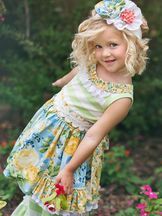 Sassy little girls who have grown up with their dresses and outfits, adore these designs made just for them. 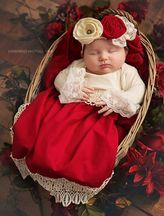 The fall 2019 collections from Haute Baby is filled with the same quality we have come to expect, and features a fabulous blend of tones and textures. Fairy Frost is soft and endearing. Warm ivories and light blues blend together perfectly. 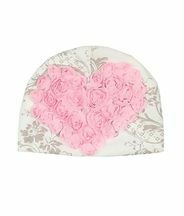 The fabrics used in this collection include a soft brushed lace and a polk-a-dot mesh. 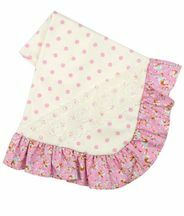 Several of the outfits have a touch of warm pink added in the hem or waist. Tis the Season is aptly named after the gem of the sea. 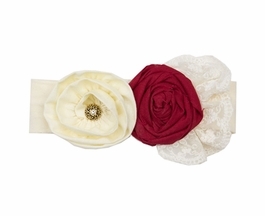 This collection is founded on a red cotton covered with a generous sprinkling of lace. An ivory lace finishes with a scallop hem. 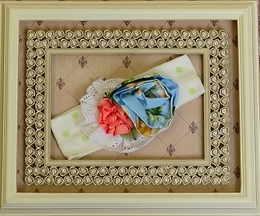 Chic Petit is another collection that is found in the spring designs. 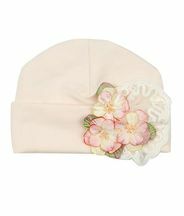 Soft cotton in light pink is formed into simple designs that are filled to the seams with style. 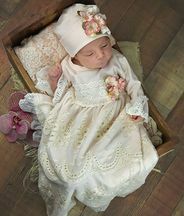 Each outfit or gown is completed with ivory lace covered in a petit babys breath pattern. 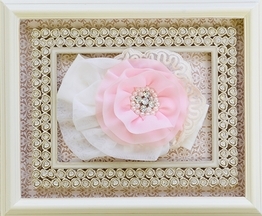 Large flower accents are created with sheer fabric and shining pearl centers. They understand that special occasions are not the only events that you will want to remember for a lifetime. 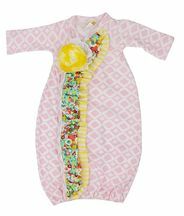 While having a gorgeous baby take home gown from any of their collections is sure to make her newborn photos beyond adorable, every day small moments also deserve a beautiful outfit. You never know when one of these every day moments will turn into a smile or a twirl that you will remember on the day of her wedding or when you see the same smile in her child. 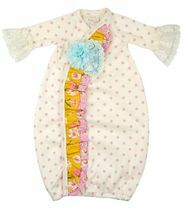 When browsing the designs from Haute Baby, expect to be struck with a feeling, immediately knowing which one is meant for her 1st birthday, or which fancy dress will perfectly suit her this holiday season, or which design will grab her heart and become the favorite outfit she wants to wear at least once a week. 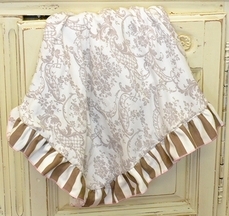 The secret in their recipe is that the sweet fabrics, sassy ruffles and sophisticated lace charms all who see them. 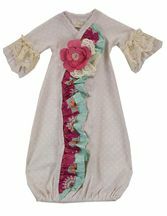 If you can't quite find the Baby Girls Dress you are looking for, check out Katie Rose!